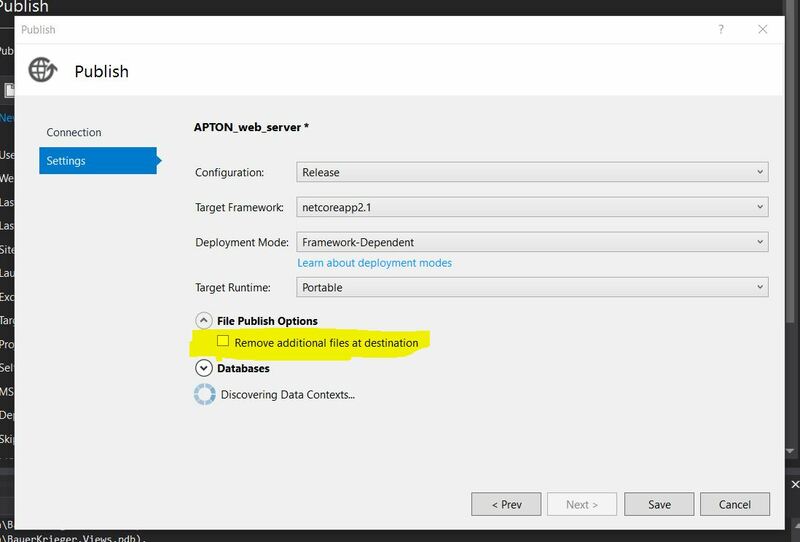 ASP.NET Forums/General ASP.NET/Configuration and Deployment/How to exclude from VS2017 web publish specific folders? In my specific - weird - use case I have some static files on my backend project wwwroot/images subfolder. Whenever I web publish I want to ignore my local wwwroot/images folder and avoid deleting/overwriting the existing folder on the web server. Basically, I want the images to stay on the server and avoid storing them locally. What's the easiest way to accomplish this? Re: How to exclude from VS2017 web publish specific folders? So they are basically "data" ? In this case my personal preference is to store them outside of the site as part of a "data" folder and serving them through a controller. In short I always ensure I could delete and deploy a web site without any data loss (AFAIK any trick you could imagine won't prevent to lose those files if doing something wrong). In this case my personal preference is to store them outside of the site as part of a "data" folder and serving them through a controller. What do you mean with this? You have a folder outside of IIS Sites controlled by an entirely different "solution", which in turn only serves static assets locally to running websites? See the following to exclude files and folders from deployment. Hello, thanks for the link. I see that it's a specific guide aimed at Windows Forms projects, also kinda dated, it's referring to VS2010. Can I still apply the same solution for different cases? I'm using .NET Core 2.2. From what i can find on google my bet is editing File Properties? I'm looking for the correct, best way to handle this. 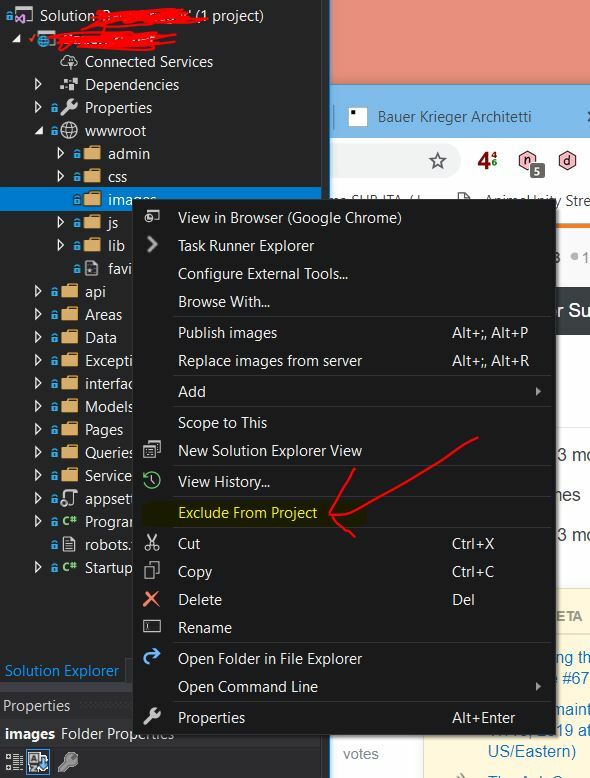 Right click on the folder/file you want to exclude from the project and select "Exclude From Project". This will update your .csproj file with the correct XML statements in a correct syntax (which is not obvious lol). Also make sure the setting "Remove additional files at destination" is unchecked if you're using the msdeploy method of publishing. Not sure if excluding stuff from the project is the way to go, tho, any advice? You don't need another solution. A web site is able to read files stored outside the web site (to serve them through a controller for example). My concern is that though it works, it makes easy to forget later about that and have someone to wipe out the site including your data. I prefer to maintain a strict separation between the "program" and its "data". Or this is just an optimization to avoid publishing them again and again but it's ok to just keep those in your current project if you really need to publish that again? Is this part of your "program" or are those files to be considered as application "data" ??? @PatriceSc It's for a custom CMS where the users can upload photos that will be displayed in the frontend. Because uploaded photos are in the wwwroot/images/progetti/** subfolder I wanted to ignore that folder when publishing so files actually uploaded from users don't get overwritten by error when publishing the solution with msdeploy. I like your approach tho. You literally created a folder somewhere in your Windows Server that stores data etc.? That would indeed solve lots of problems.